The Olubadan of Ibadan land, Oba Saliu Adetunji, has distanced himself from the move to install new kings in Ibadan land or play any part in the coronation today. The Oyo State Government will present crowns to 24 new kings in Ibadan land, instead of the 32 earlier announced. Out of the 11 high chiefs that are to be crowned, two are late. They are the Otun Balogun of Ibadan land, Dr. Femi Olaifa, who died on Friday, and the Ekerin Balogun, Samuel Falowo. The coronation will take place at Mapo Hall in Ibadan. In a release by the Olubadan’s Director, Media and Public Affairs, Adeola Oloko, on Saturday, Adetunji warned that his name should not be included as the father of the day at the coronation. The monarch said, “I’m saying for the umpteenth time that I am opposed to the chieftaincy review and its recommendations as the process for such an exercise has not been followed. Therefore, I cannot see how, as being advertised in the media, I could possibly play a fatherly role in an exercise that I have not endorsed. 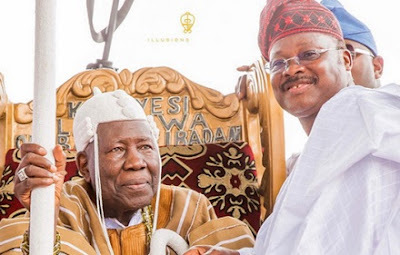 In a related development, the Osi Olubadan of Ibadan land, Rashidi Ladoja, on Saturday, described the presentation of letters of conferment to the new kings in Ibadan by the state government as an act initiated by Governor Abiola Ajimobi to distract the people from the “misdeed” of his government. The presentation followed the recommendation of the committee set up by the governor to review the Ibadan chieftaincy declaration.